After the interview with YokosoNews Sunday afternoon, we headed over to the garden to see what was happening. Last year when we returned from our trip to America, the garden was bursting with leaves ready to eat. This year proved much the same. 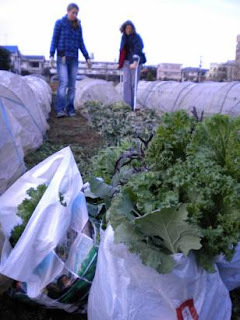 Komatsuna, wasabina, karashina (both green and red), arugula, and mizuna are making a concerted effort to lift off the row covers. An older fellow stopped by as we were working ('we' meaning my friends and husband doing my bidding as I hovered over them on crutches) to say they were too big to eat, but we just laughed. The leaves are larger than normal since they stayed in the ground so long, but they still make a great addition to miso or salad. The garlic is happily sprouting in the west wall bed, and some of the crocus I planted are blooming, too. One rhubarb crown looks like it's more than ready for spring, but the other is nowhere to be seen. I suspect that the long hot summer may have been too much for it. The cabbage and broccoli plants look less than pretty as they've been ravaged by caterpillars. Last year I'd covered them, but this year I didn't. The kale, which I covered shortly before leaving for America, looks good and unsnacked upon. Lesson learned. Otherwise, everything looked pretty good. There's no shortage of work to be done, and the list I've started compiling in my head is already long. I'm looking forward to it, although I might need some help eating all of our produce. If you're reading this and in the Tokyo area, give me a shout. I've got vegetables to share if you've got the inclination to head over and can lend a hand for moment. I can even offer a recipe or two, too! I'm so jealous that you're already able to garden. Not the case here, haha. I've got a garden to plan for this spring so I'm getting super antsy about it! It's a community garden plot, right? You're going to have a blast! What are you thinking about growing? I'm hoping to get some seeds started today or tomorrow.